They Don't Build Them The Way They Used To? Well, they don’t. Thank god. Most of these old woody’s were built to last up to 6 years. And in many cases they lived up to there task. You can here old Mr So and So back in 1950 complaining about how things are not built the way they used to. The good news is that there are some great folks out there, building them better than they used to. Not with short cuts and tricks, but respect for the vessle. Respect for the owner and with great pride in craftsmanship. There are countless examples. Hacker Craft, GarWood, Streblow and AristoCraft. You can even buy a brand new Barrel Back from Fish Bros. For the person that wants the look, feel, and spirit of a woody boat, and use it with out trashing a piece of history. These are the boats. They are building some beautiful new woodys. Here’s another one to add to the list from near St. Louis. 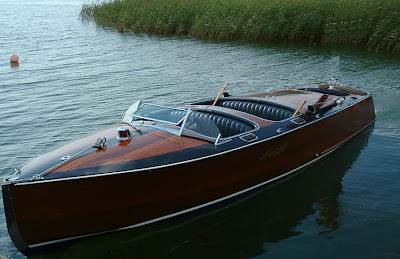 It’s http://www.portageboatworks.com who have two specific beauties but will build one to yiur spec’s also. Their triple cockpit prototype was autographed by Chris Smith, grandson of Chris Craft’s founder.